Early Monday morning on Detroit’s west side” there was an unspeakable tragedy that is beyond words and is truly saddening and heart wrenching. A 9 month old infant was shot and killed due to stray bullet that struck the front door of the family’s home Monday morning. This story cannot be put into words and I cannot comprehend the reckless actions that lead to the death of this beautiful baby boy. Below is a an article from the Detroit Free Press with all the information in the case and the number to Crime Stoppers. IF ANYONE Has any information that could help solve this tragic case PLEASE speak up. We all need to band together and do everything we can to stop heinous and malicious acts of violence that are utterly reprehensible and senseless. PLEASE STOP THE VIOLENCE PEOPLE. AND KEEP THIS FAMILY IN YOUR PRAYERS. GOD BE WITH US!!! ” Grieving family members gathered at a home on Detroit’s west side this afternoon, where a 9-month-old boy was killed hours earlier when 37 bullets were fired into the home as the baby slept in the living room. Delric Waymon Miller IV was shot in the 8400 block of Greenview. He was rushed to the hospital, where he was pronounced dead, relatives told the Free Press. No one has been arrested. Detroit Police Chief Ralph Godbee Jr. said at a news conference this afternoon that the shooting is believed to be gang-related. Crime Stoppers of Michigan is offering a $5,000 reward for information. Diamond Salter, 19, the infant’s mother, said eight people were home sleeping at the time of the shooting, including three children. She took him into the basement and realized he had blood on him. The infant wouldn’t wake up, she said. Relatives said he was shot in the arm and the bullet came out the other side of his body. Salter said she has no idea who was responsible and described her son as a joyful baby. Godbee said police received a call at 4:20 a.m. that shots were being fired. He said police believe several people exited a vehicle, and one began shooting with an AK-47. The others did not fire shots, he said. The vehicle was described as a light-colored minivan. Godbee said some people aren’t being cooperative with the investigation, but he did not elaborate. He warned family members against retaliation. Henry Jackson, 51, was getting ready for work when he heard the shooting. His initial thought was it was on television. He said the gunfire sounded like it was coming from a semi-automatic weapon because of the way the bullets were firing. Neighbors described hearing about 30 shots. The glass on the front door was shattered, and a few dozen bullet holes could be seen this morning on the front of the house. Family members pleaded with whoever is responsible to turn them self in. “It’s only going to be a matter of seconds before you’re caught,” said Halas Rochon. Delric was her great nephew. Diane First, 66, lives across the street and said she was coming out of the bathroom when the shooting started. She put her dogs on the floor and got on top to protect them from any bullets that may have ricocheted. The shooting lasted a few minutes, and the bullets were rapid, she said. First said she didn’t see anyone. “I was too busy ducking,” she said. Jason Smith, 27, lives down the street and was in his home in the 8600 block of Greenview getting ready for work when he heard the gunfire. He crouched down in his home because the gunshots sounded close. “I just got down trying to figure out which direction they were coming from,” he said. He saw an ambulance and police arrive on scene. Neighbors say several adults and children could often be seen at the home and say the family has lived there for about 1 ½ to 2 years. Police say the first 24-hours of the investigation are critical and ask anyone with information on the shooting to call 313-596-2260. 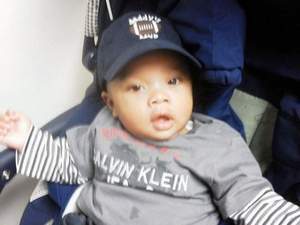 The baby is the second child to be killed by bullets fired into a home in recent weeks. On Jan. 31, 12-year-old Kade’jah Davis died after bullets were fired into her home on Ferguson in Detroit. A mother and son have been charged in the case. As of Feb. 12, a total of 41 homicides have occurred in Detroit, a 24% increase compared to the same time in 2011, according to Detroit police crime statistics.